I think we can all agree that when you travel anywhere around the globe, a crucial find for any traveler is a delicious cup of hot coffee or espresso. Even if your traveling companion likes tea, locating a hot beverage to start your day is key. Sometimes it can even make your visit that much more enjoyable – because you’ve started your morning off just right! Next time you’re in the North Lake Tahoe area, we want you armed and ready for your mornings. Though there are many great establishments in the Truckee/Tahoe area where you can enjoy a hot cup of joe, we had trouble picking just one. Ours is a tie between two favorites. Here are our uber local tips for the top coffees in the Truckee/Lake Tahoe vicinity. Taste is clearly subjective, you decide for yourself who’s the best of the best, and be sure to let us know! Maybe you disagree with us altogether (and that’s fine too). 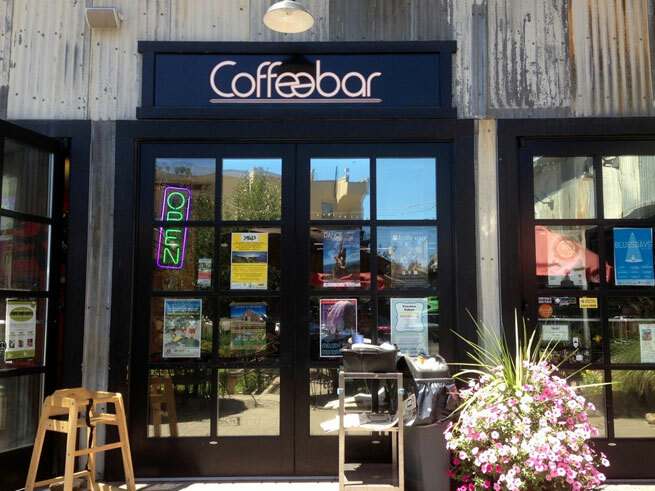 One of the smoothest pulls of espresso or foamy latte you’ll ever find is at CoffeeBar, an Italian coffee shop in Truckee, CA. Opened three years ago by Greg Buchheister, CoffeeBar’s espresso beans are Grade C1. What does that mean for you? That means C1 is the highest level of industry designation in the coffee business, and you’re drinking the Ferrari of coffees. You may pay a pretty penny, but we promise the organic, locally roasted Italian blend is worth it. Take some time to soak in the Tahoe vibe – local artistry on the walls, regulars floating in and out all day long–it’s not your average coffee shop, it’s more of a community … with espresso that will leave you buzzing in the best way possible. Local tip: You’ll find fresh gelato here in the summer time, and if you want to a find a seat inside during the winter (especially on powder days) come early! Originally opened in 1977 as Tahoe House Restaurant by Peter and Helen Vogt, Tahoe House served dinner only. 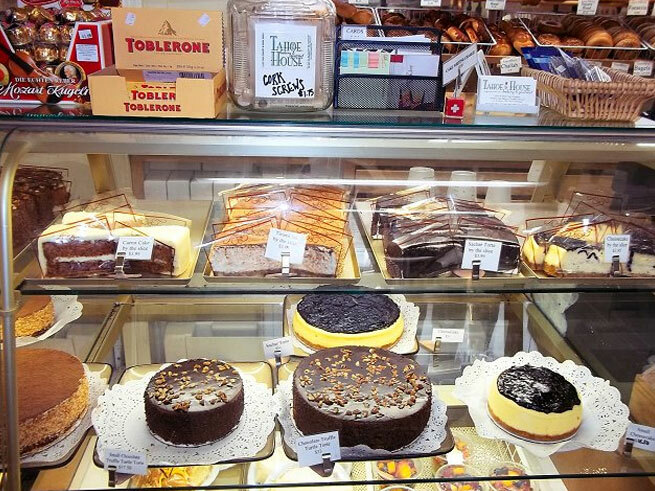 Originally from Switzerland, the Vogts have always executed fabulously and deliciously European cuisine. After a remodel in 2001 Tahoe House removed the restaurant portion (many tears shed by locals for good reason), but it held strong with locals offering to-die-for baked goods and brewed to order coffee. There a few things the Swiss can’t get wrong: chocolate and a primo cup of coffee. If you ask locals, Tahoe House is beloved for its strong, frothy coffees that are neither espresso nor drip coffee nor french pressed. They are single brews by magical ‘espresso’ makers. It’s an Alpine experience for your tastebuds you simply can’t pass up. Local tip: In addition to your morning coffee, strongly consider the famous Sacher (chocolate and raspeberry) torte for special occasions. Beware, it generally doesn’t last long at the table. 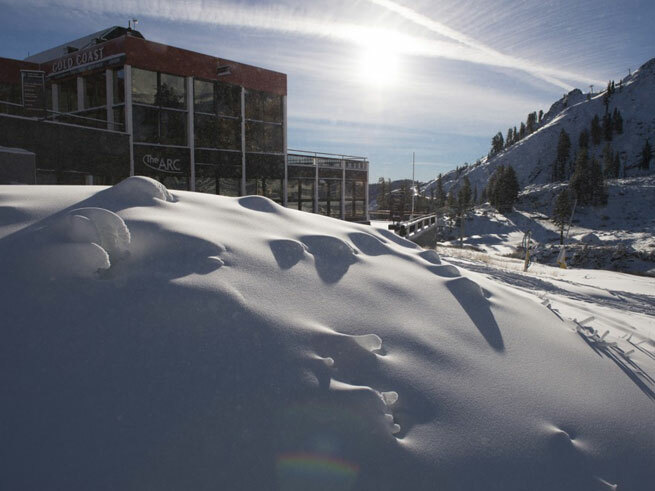 Squaw Valley Opening Day And Big Tahoe Storm Ahead! It’s almost here! We’ve waited all year for new snow, and last week we received 6 inches. With cold temperatures in the area the Squaw Alpine snowmaking team was out in full effect with their guns blazing! Just in time for Opening Day tomorrow, November 26th! To find out more about Opening Day, lift operations, and other activities, click here. Although we’ll see some mild (warmer) temperatues this week, a significant storm is headed our way Sunday through Tuesday. If the models line up just right, we could be look at 2-3 feet in the mountains, and possibly 4 feet along the crest. Do you have your Tahoe Super Pass yet? 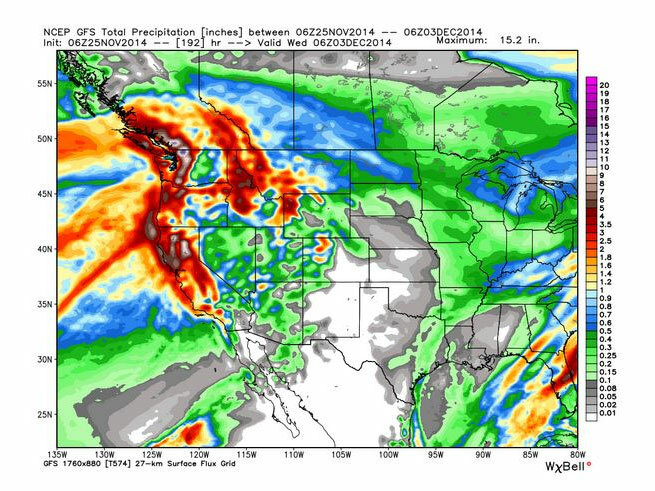 A look at the heavy precipitation headed our way on Sunday. If you’re not going to be in town for Opening Day, next week could be some of the best powder we’ve seen in a long time! Remember you can save on your booking with our current Manager’s Special–up to 33% off your stay! 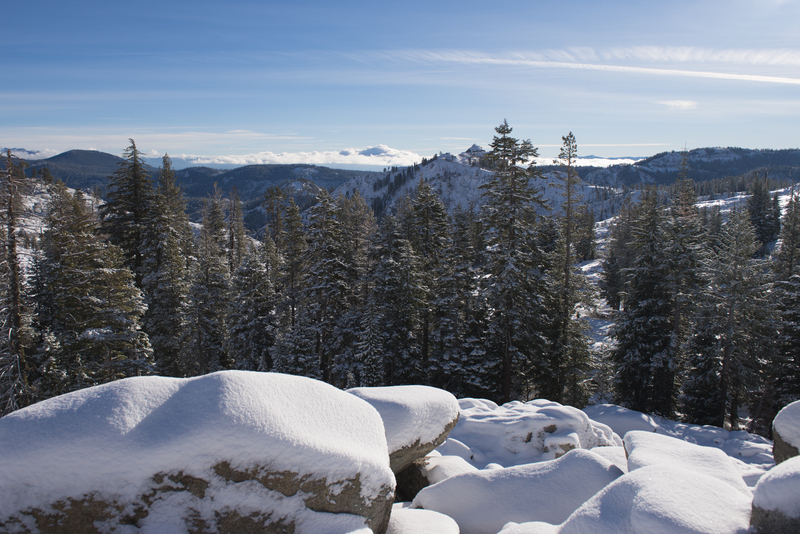 Check out how to book and save for your next family ski vacation at Squaw Valley Lodge! With winter on the horizon, it doesn’t matter if you’re a lady or gent–you’re thinking about, dreaming up, and hoping for snow. But if you’re a gal about town in Tahoe on a Saturday night, and looking for something fun to do before the powder hits, join fellow ladies in the area for a fun night at one of our favorite local outfitters. 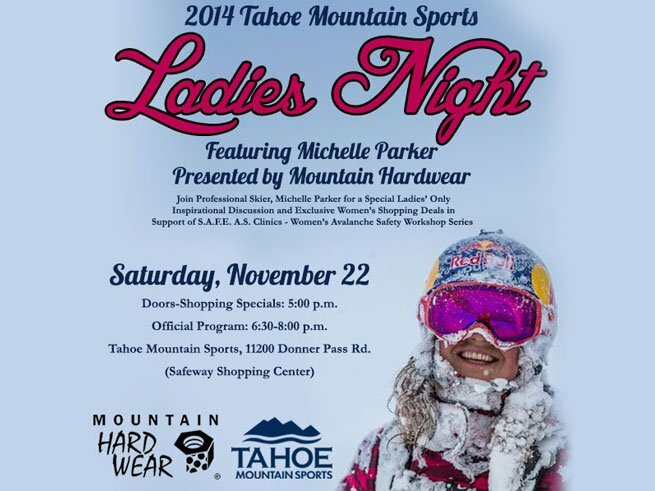 On November 22, Lake Tahoe native and pro-skier, Michelle Parker, will host a FREE evening at Tahoe Mountain Sports (Tahoe City, CA), leading a motivational discussion on her career and what it takes to be a successful action sports athlete. Doors open at 5:00pm for shopping specials. There are great discounts on gear and clothing only ladies will enjoy during this event! There are also fabulous raffle prizes, including a Ghost Whisperer hooded down jacket ($300 value) from Mountain Hardware, and so much more to check out! The official program begins at 6:30pm. All proceeds from this event benefit the SAFE AS Clinics, a local non-profit organization that heightens the awareness of community snow safety and avalanche awareness for women in an open and welcoming environment. You can RSVP to the event on Facebook HERE! Wildflour cookies are a taste of heaven after being on cloud nine at Squaw Alpine all day. You’re not the only one dreaming of winter. With the lows in our fall temperatures, last week’s snow storm really solidified how close we are to winter. That means it’s time to reserve at Squaw Valley Lodge for mad savings, and Cookie Madness! With snow on the we we’re craving skiing, snowboarding and Wildflour Cookies (hot out of the oven after a long day on the slopes)! Squaw Valley Lodge is the closest lodging to Wildflour’s famously good cookies – and you all thought ski-in/ski-out was our best feature. Now that is madness! 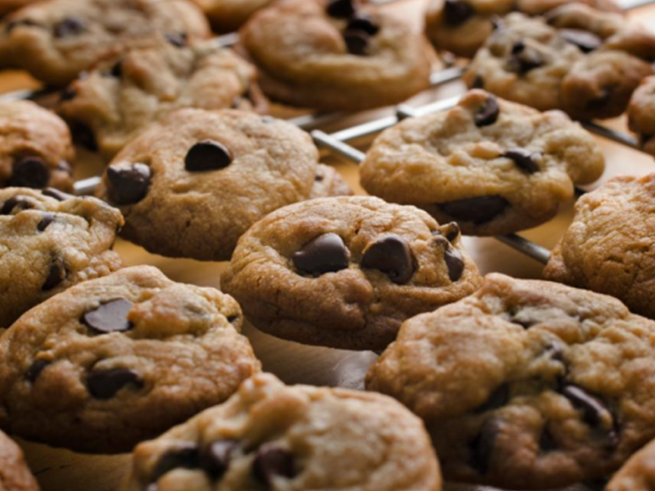 Reserve your special Squaw Valley Lodge Winter Cookie Madness Package while you can! Rates start at $165* per person/per night for a three night midweek package. You must book by November 20th for this special package, and the clock is ticking! Three nights in a Deluxe Studio. Two night stays available as well. Two Day Lift Tickets at SquawAlpine for two people. Two 10-punch Cookie Passes from Wildflour Bakery. Passes are good for all Wildflour’s delicious menu items. Free room upgrades upon arrival. Based on availability. Valid December 1 through April 16, 2015*. Custom packages are available. Changes can include: different room types, number of lodging nights, massages, equipment rentals, or removal of lift tickets if you have a season pass or other tickets. *Quoted rate is based on double occupancy for the full midweek package: two, 2-day lift tickets, two 10-punch cookie passes, and three midweek nights in a Deluxe Studio. Two Night Midweek Package is $248 per person/per night in a Deluxe Studio, based on double occupancy. All promotions are subject to change, blackout dates and availability. If the package does not work for your vacation, other discounts or promotions are available. Current blackout dates include December 19- January 4, 2015; January 16- 19; February13- 21, 2015. With Saturday’s recent snow storm at Lake Tahoe, Squaw Valley and Alpine Meadows got 6 inches to kick off the winter season. Though temperatures will rise this week, it has definitely gotten us pumped for powder! With an El Nino winter on the horizon, of course we’re hoping for big storms, deep snow, and fun days on the slopes. While we cross our fingers and hope for an epic year to match the winter of 2010/11, why not check out a new ski film premiering at Tahoe on Sunday, November 23? Join other locals at Homewood Ski Resort to view Level 1 Production’s “Less” premier, featuring athletes like Duncan Adams, Will Berman, LSM, Magnus Graner, Tanner Rainville and more! The film was shot on location in the U.S., Canada, Poland, Sweden, Switzerland, France, and Japan. Enjoy the screening of “Less” outside around the South Lodge fire pit (so be sure to bundle up! ); heat lamps and warm cocktails are provided to keep you cozy. 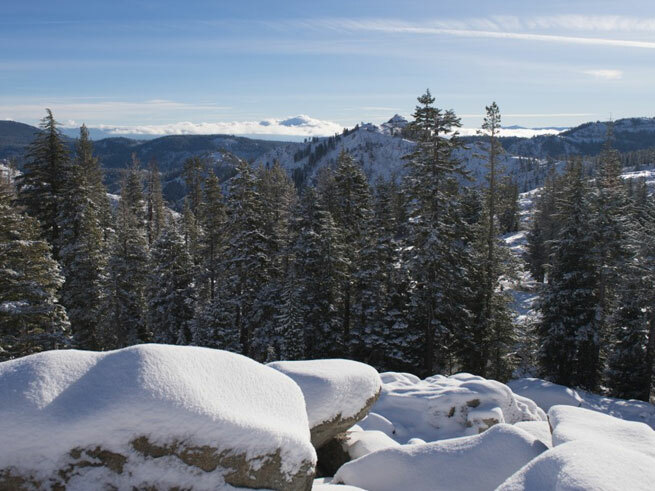 Sierra Avalanche Center will also give a short presentation about their efforts to keep backcountry skiers and snowboarders safe and educated about the terrain. You won’t want to miss this if you plan on any backcountry this season! “Less” tickets are $12 in advance or $15 at the door. And of course there will be raffle prizes available – even a snowcat trip on the new Homewood Snowcat Adventures ($399 value). 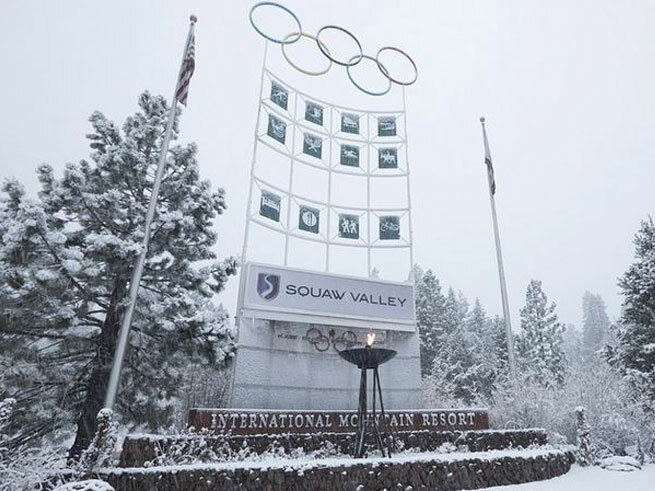 Remember Squaw Valley Lodge’s winter sale is going on for stays between November 21, 2014 and April 30. 2015! 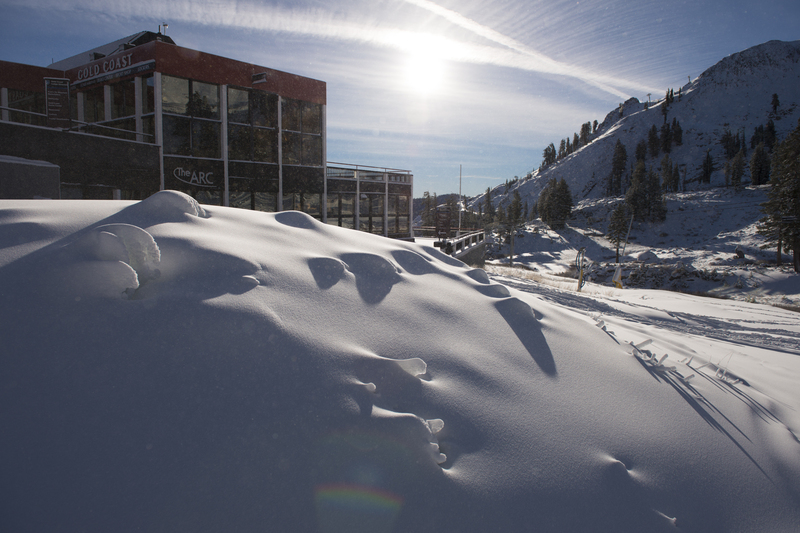 You could save up to 33% off, so check out our best rates, stay a few nights, catch the premier of “Less”, and stay for opening day at Squaw Valley on November 26 while you’re at it!